At Checkered Flag, we use factory recommended parts with every oil change, like the oil and oil filter. Why is it important to use factory recommended oil filters? Not all oil filters are created equal. The anti-drainback valve is a prime example. An anti-drainback valve ensures that the oil in the filter does not drain back into the pan, ensuring that your engine remains lubricated while the engine is off. Many vehicles require this, so that there is always oil in the engine. If your vehicle needs this type of oil filter, and doesn’t have it, oil will not be in the engine until you start it, leading to future engine damage. The make and model of your vehicle will determine what features your oil filter will need, as well as what type of oil it requires. Therefore, Checkered Flag ensures that every oil change is done with factory recommended oil and oil filters. Cheap oil changes are “cheap” for a reason, and there are tons of horror stories on this topic. Stories range from putting oil into the transmission, while others detail not putting oil back in all together! Your vehicle is worth thousands of dollars, so why risk it to save a few bucks? Cheap oil change offers don’t include synthetic oil (required by many newer vehicles). First, you arrive expecting a $20 oil change only to find out the synthetic oil change is three times as much! Synthetic oil is more durable than conventional oil. As a result, many synthetic blends only require changing every 7,500-10,000 miles (check your owner’s manual) compared to the conventional 3,000 – 5,000 mile interval. 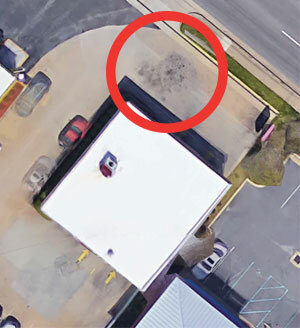 Your quick lube oil change shop can’t pass the Google Earth test, so don’t go there! 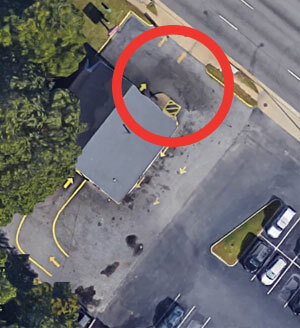 Below you will find Google Earth images of various quick lube shops. 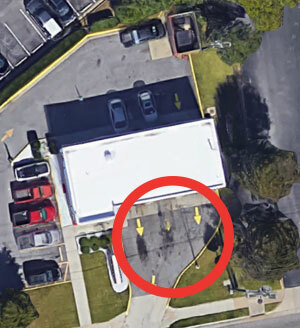 While they save you money up front, a lot of your oil is left behind (see all the oil stains in the exit lane?). At Checkered Flag, your oil change is done by a factory trained technician, specific to the make of your vehicle. Because of this, all service work Checkered Flag performs is guaranteed. If anything fails due to our workmanship, you are covered! Use any of our service schedulers by clicking the links below.